Using plenty of natural hot springs springing up from the basement of 1,200 m, we also have an outdoor bath, a large bathtub and other saunas, a sense that the mind, body and nature are united. The alkaline water quality of ph 8.69 is warm water that wraps around the skin, and the skin of the next morning is very popular with women as it remains smooth. 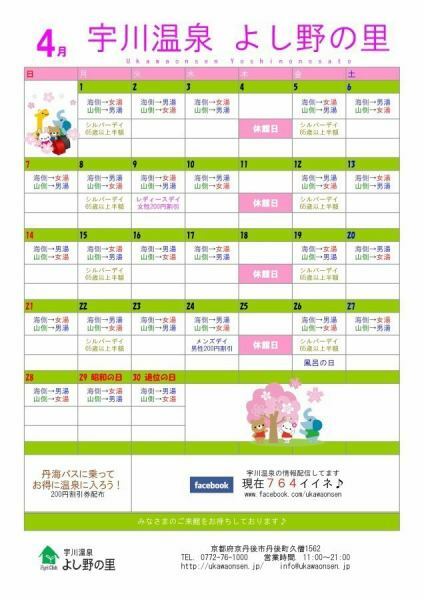 It is a schedule of April. 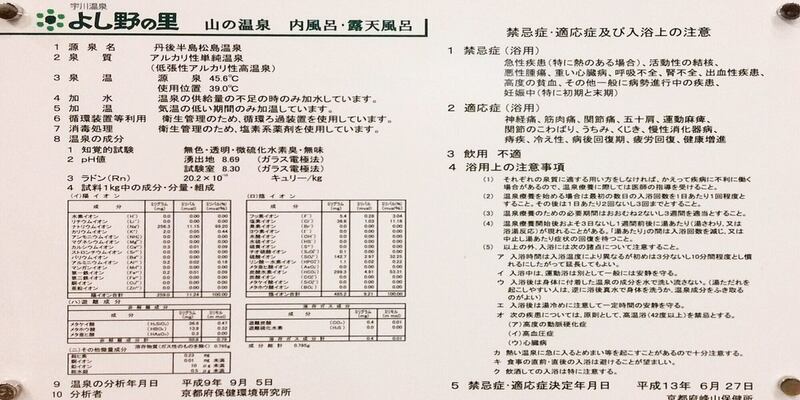 ② In this hot spring, male and female hot water will be replaced on a daily basis. In the hot spring, rinse-in shampoo / body soap / hair dryer is always available. There are no provided towels, so if you use a day spa, please prepare towels. 3 For the sea side and mountain side male bath and female bath, please refer to the above calendar or Ukawa Hot Springs overview for details of discount days and holidays. Sea Onsen "Ryugu", warm water of Sea Onsen "Ryugu". You can overlook Japan. Nature rich spa where mind and body are healed.Please leave time away from the hustle and bustle of the day and experience time. In the morning and evening, and the Tango sea which changes the expression every moment every moment. It is a superb view bath and it is a heavenly hot water. From the open-air bath you can see the Sea of ​​Japan and it has an open atmosphere as it is on the hill. It will give you the healing of the bliss while bathing in the sunset that enters. 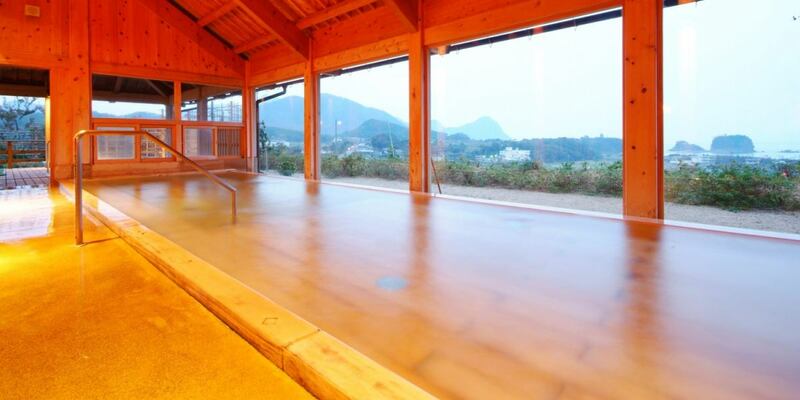 Mountain Onsen is an open-air bath of a Mountain Onsen "Koguya". Bamboo groves are beautiful, hot water.Mountain Onsen "Koguya"
Beautiful bamboo grove spreading in front of you.It seems like a fairy tale as if the lights are swaying on the surface of the water. It is a hot spring in the forest, where the sunlight and greenery of the forest are clear in the morning, and the ears of the birds can be heard if the ears are clear. Unlike Sea Onsen "Ryugu" Sea Onsen, you can receive the power of the land of Japan's hometown and "Tango Kingdom 1300 History". Every week, Monday, Friday, "Silver di,"
For people over 65 years old, the hot spring bath charge will be half price (300 yen). Every month, on the 26th, "day of the bath"
For bathing people, we offer hot spring bathing fee and half price ticket to all. Every Tuesday in the second week, "Ladies Di"
Women are hot spring bathing charges, 200 yen discount. Every month on Wednesday of the fourth week, "Men 's Day"
Men are hot spring bathing charges, 200 yen discount. 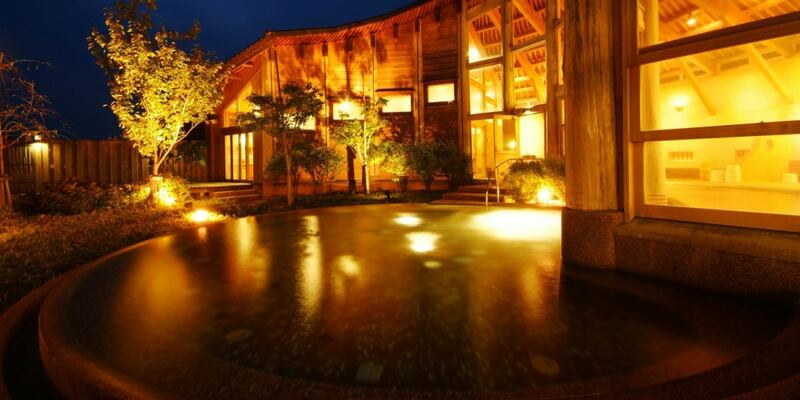 ◆The hot springs are closed at 20:30 and 21: 00 leaving the building.